Follows the American Mini Pig Association’s Rescue Code of Ethics (LINK). Is honest and ethical in all endeavors. Puts the welfare of the rescued pig above convenience or personal desires. Ensures all animals are up to date on vaccines, deworming, microchipped, and spayed or neutered BEFORE placing them in adoptive homes. A reputable rescue organization never adopts out an intact pig. Never. Spay or neuter contracts do not protect the pig. Spaying and neutering before leaving the rescue protects the pig. In addition, all medical needs are addressed before adoption. Signs of illness or injury are promptly evaluated by a veterinarian. Thoroughly screens foster and adoptive homes. This includes a foster or adoption application, veterinary reference, phone interview, and a home visit. This screening protects the pig from being placed into a neglectful or abusive situation. The fate of rescued pigs is in our hands. It is our responsibility to ensure they are going to the best homes possible. To understand why screening is so important, read (LINK) The Fate Of The Abandoned Pig. Documents the adoption process to protect the pig and the organization. Surrender form, adoption application, adoption contract, foster applications, and foster contracts are filed in the pig’s permanent record. Follows all state laws regarding traveling including permanent identification, CVI or Health Certificates, vaccines, and/or bloodwork as required. Places incoming pigs in quarantine as appropriate to prevent the spread of disease to the existing herd or incoming pigs. Strives to maintain a healthy weight for all pigs. Does not promote obesity or underfeeding. Maintains hooves for the health and welfare of the pig. Provides a clean and spacious environment for all pigs including appropriate fencing, outdoor time, protection from weather, and separate areas for intact boars and sows until they are altered. Only takes on animals they can care for within their means. Utilizes foster homes to ensure every pig is getting the attention and care he deserves. Allows time for pigs to be assessed for health and temperament before placing in adoptive homes. Is passionate about education and outreach as well as rescuing and adopting. A responsible rescue understands that rescuing and adopting is not enough to protect the pigs. We need to reach out and educate potential and current pig families. Stay in contact with adoptive pig owners to ensure they have all the support they need to keep the pig and family happy. 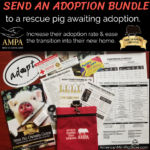 A reputable rescue supports adoptive homes throughout the life of the pig to stay in his home through advice, training, problem solving, and guidance. Will help adopters find the right match for their family and household. Will offer information on the positives and negatives of the particular pig. Never adopts an animal as a gift or surprise. The entire family must be aware and welcome the adoption. Promotes adoptable pigs in as many outlets as possible to find appropriate homes. Maintains responsibility for the pig for the remainder of his life. They do this through keeping in contact with the adoptive home, maintaining contact information on the microchip, and have a return policy that the adopter MUST return the pig to the rescue if they are no longer able to care for him. The rescue will openly take the pig back at any point in his life, for any reason, without punishment. Follows up after fundraisers to show how the funds have been used and the how it has helped the animals at the rescue. Will openly explain the adoption fees and how the money is used. Provides receipts of veterinary bills and tax records. Has a good reputation in the rescue community and is respected by their peers. Returns phone calls and emails in a timely fashion. Has a good relationship with its volunteers and adopters. Has not had animals seized by Animal Control. Is not associated with anyone convicted of animal abuse, neglect, or fraud.